William Howard is an independent, fee-only financial planning and investment advisory firm. We are committed to providing excellent service to our clients by listening to them, working with them, and crafting a solution that works for their future. Since 1984, our firm has developed custom financial plans that address the stated financial goals and objectives of our clients. We work to build a strong, professional and long-term relationship with our clients. 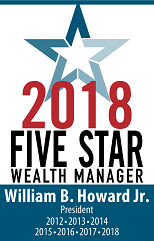 Through this relationship and with our experienced staff, William Howard provides a high level of specialized services for the financial planning and investment needs of our clients. At William Howard, we provide exceptional client service through successful client relationships. These long-term relationships are mutually interdependent: in meeting the goals of our clients we meet our own goals as a valuable financial partner. When your goals and objectives are met, then our goals and objectives are met. Your success is our success. We work with clients on the principle that goals and objectives are accomplished through a well-planned strategy that emphasizes commitment, education, evaluation, monitoring, the evolution of the process, and the attainment of goals. Contact us today to learn more about our firm, our services, and how we can help you gain financial peace of mind for a lifetime.